Before I knew my son, Jack, would be around, I booked a girl’s trip to the beach. If I had known I would have a three week old and a fourteen month old, I would have never dreamt of a vacation – especially without kids. However, my husband, who is the kindest man in the world, insisted that I go. It took a lot of discussion, and an obsessive amount of prepping and scheduling, but I agreed to go. I don’t care how much you love your kids, everyone needs a break. Sleeping without interruption is almost as glorious as eating without stopping to change a diaper. The timing of this one may not have been perfect, but is it ever, really? To prepare my house, I cooked and froze meals, hired a nanny to help while I was gone, and I took one of my three dogs to the kennel. 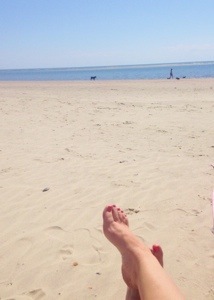 So here I am… On the beach… Laughing, eating and sleeping… I am being so careless, I got a sunburn yesterday… Gasp! I’m still not sure that going was the proper decision because I miss my family like crazy. I am confident that everyone will change just a little bit while I’m gone and I hate to miss a single thing they do. But, this has been a fabulous trip and I am so grateful to my husband and mother-in-law for the encouragement to go. And to my friends for reminding me that it’s okay to be gone. Do you travel without kids? How do you do it? Mary, I wish I was on the beach right now, with you! I honestly don’t think I could travel without them. Exclusive nursing the infant is one reason, but even if I wasn’t nursing I don’t think I can be away from them, it would be too hard on me! Maybe in a couple of years I will feel more capable?! Enjoy the beach, and the sleep!